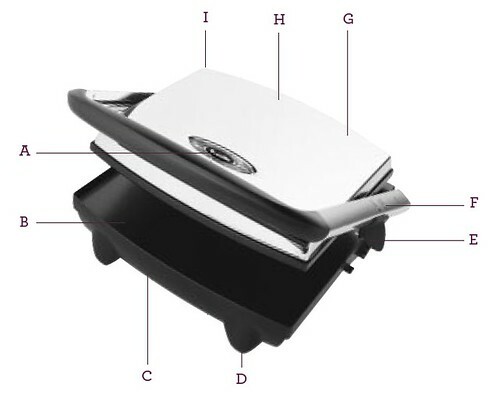 The Breville® SG820XL, Maxi 2~in~1 Panini Press™ – Some sandwiches are just better toasted, and with the Maxi 2~in~1 Panini Press, you can do just that. The big brother to the Breville® SG620XL 2~in~1 Panini Press™, the compact but powerful sandwich maker can do twice as many in a single shot. Italian style sandwiches and snacks in just minutes. A. 1500W Concealed Element. 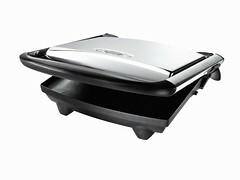 B. Non-Stick Extra Large Flat Cooking Plates. I. Concealed Hinge. J. 'Warm Up' and 'Ready' Lights.